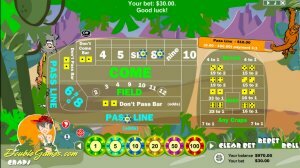 Soft14: Prehistoric Craps - This hazardous absorbing game with a non-predictable ending will win your heart! Very long ago when mammoths trampled down the earth one man lived alone in a cave. Of course, he had relatives and friends, but all of them were far away from him. The reason was simple: they were noisy they didn't let him work and disturbed him greatly, so he left them. The cave man was an inventor and this profession needed his concentration and attention, especially when he was a prehistoric inventor. One day he made a net. It was thin stripes of bark tangled up chaotically. The net appeared to be a useful invention as it was simple to catch birds or small animals with it. But once the man discovered a little monkey in his net, it was so defenseless and cute that his prehistoric heart took pity on the animal for the first time since people lived on the Earth and the cave man took the monkey home. They lived in harmony and they were the happiest couple in the world. All day long the man was making new models of axes, spears and knives and the monkey was sleeping on the nearest tree or eating insects. Sometimes they did something together, for example, they loved walking and playing. And now you see their favorite game. It is called Prehistoric Craps. You can play this game with them, just place a bet, shoot the craps and wait for a result. This hazardous and absorbing game with a non-predictable ending will win your heart! Take pleasure in the music, graphics and game.